Spacious apartment of 140 m2 with swimming pool (and a seperate childs pool) in a new modern building (2010) with an elevator, just outside Kralendijk. The apartment has 2 large bedrooms with screens and air conditioning and 2 bathrooms. An extra bed is available for a fifth person of sixth person/child. There is a nice terrace with sun and a large dining table. Open and modern kitchen with dishwasher, oven, microwave fridge and freezer. Spacious living room with a dining table, two sofa's, a flat screen with satellite connection and two ventilators to keep it cool. Internet connection. Washing machine. Private storage on the ground floor for your diving equipment. Opposite the building is a gym. Private parking in front of the building. 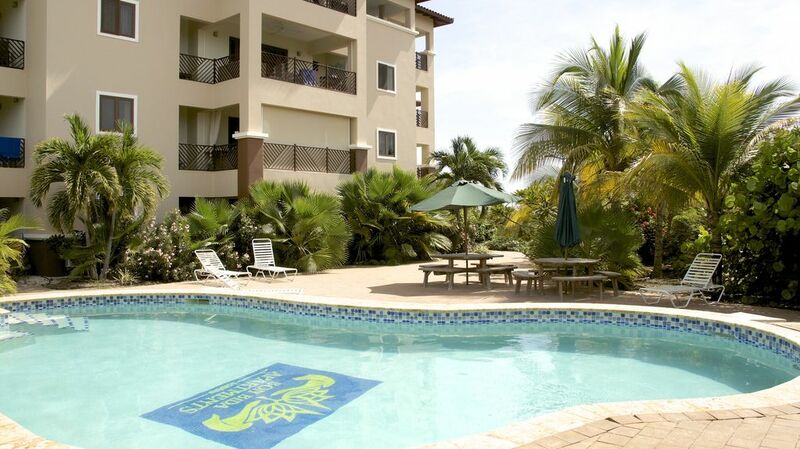 The apartment is within walking distance of Spice Beach Club with free beach chairs for Bon Bida. On this beach you can take three times a day a watertaxi to Klein Bonaire. Also on walking distance are two diving schools. Short drive away is the lively Kralendijk. Kralendijk is a quiet little town with lots of pastel-colored buildings. The center of the city consists of a boulevard (Kaya Crane) and a shopping street (Kaya Grandi) with several restaurants and bars. Bonaire is a true diving paradise. You can get almost anywhere snorkeling and diving right from the shore. Two diving schools on walking distance. The best surfing spot on Bonaire is at Lac Bay. Sorobon Beach is beautiful, even for non surfers. Great food and cocktails on the beach. Visit the Washington Slagbaai Park, slave huts, the salt industry and the wonderful beaches throughout the island to find. You can also visit caves, horse riding, mountain biking, kite surfing or canoeing through the mangrove forest near Lac Bay. Perfect location, beautiful, spacious apartment, great storage for scuba gear! Hubby and I went to Bonaire for 9 days of scuba diving with another couple. We picked this VRBO based on all the wonderful reviews, and it did not disappoint. It is on the 3rd floor (American floors, not Deutsch, otherwise it would be 2), but elevator and stairs weren't a problem. Parking lot sometimes was crowded, but super easy to park our truck right outside the parking lot - safe, no worries at all. We rented our truck (AB Rental, superb), and were told to leave our truck unlocked while we were on the island - we did, and had no hesitancy or issues. Off the side of the parking lot, was a storage unit assigned to each apt unit. and a huge sink to wash off your scuba gear and then hang it up and put it away. We absolutely loved this feature, and loved the fact we didn't have to haul all our gear bags up each night. The apt. itself was very spacious, nice kitchen area, and huge living room and dining room table which we used everyday to plan our next dives, play Rummikub, etc. We spent our early mornings enjoying coffee on the deck with a decent view, watching birds and donkeys, and enjoying the peace. The two bedrooms were plenty big - both have twin beds that are pushed together if you have couples. Each room also has a pull out cot. Bathrooms are humongous. Safe in master bedroom was a nice feature. Huge closets with hangers and plenty of shelves. The only suggestions I gave the owner, and she graciously accepted them, were to leave instructions for the oven and washing machine for Americans - as they are both in Deutsch. We are big cooks and planned to eat most of our meals in and spend our money on scuba fun, but weren't able to use the oven. Finally figured out how to make the washing machine work by pushing multiple buttons, but again, that wasn't huge. We will definitely be going back to Bonaire, and hubby has already said we will be staying at Bon Bida again! 10 minutes to AB rental where we rented truck and air from, walking distance to Buddy Dive's, great restaurants (you MUST go to Between 2 Buns), ice cream shop. Thank you, Tessa, for addressing our concerns and being fair about it all. We'll be back soon! Very nice, well- kept building. The apartment was large & spacious. Loved the location. The apartment was great & had comfortable furniture, which is a plus! The only drawbacks were the parking lot is small, as are the spaces in it. Often had to park outside the designated lot. The rinse tanks did not have stoppers, so basically useless. Lockers have no ventilation, so gear doesn't dry. I don't mean fyi did negative, these are small inconveniences. The rental agent was super!! The apartment is great. It's good that you tell me the small inconveniences because I'm not a diver so I don't notice these kind of things. I can ask the property manager to do something about the stoppers and maybe we can organise some ventilation in the storage rooms! Good idea. This was our second stay at Bon Bida, and we enjoyed our time here equally as much as the first time. The apartment is perfectly located for diving on the West coast with easy access to many of the Northern sites, and you have several excellent cafes and restaurants in walking distance from the building. The apartment has everything you need and is clean and modern, and everything works as it should, including the internet. And the vouchers for the beach bar close by were greatly appreciated for when we wanted a lazy day in the sun. Bonaire in itself is perfect if you are looking for a both relaxing and active holiday, and everything is geared towards divers. We will be coming back for sure! This is the second time we have stayed at the Bon Bida apartments. The apartment is a nice size and has a fully outfitted kitchen which is very important to us. All appliances are in very good condition and having the washer and dryer in the apartment is great. There is a drying rack for use on the balcony and because the apartment is 3 floors up, we felt comfortable leaving our stuff out to dry while we were gone. The access to Spice Beach is nice and is close enough to walk. There is a safe there which we made use of too. Bon Bida 12 - Can't wait to return! My husband and I completely enjoyed our 5 week stay at Bon Bida 12! The apartment is located just outside town, close enough to be able to enjoy all the city center has to offer without all the action and commotion right outside your door. The setting is peaceful. Bon Bida 12 has a pool view facing west and a mountain/desert view facing north. The building is just behind a spa and gym and a church just outside the parking lot. The building is well maintained and felt secure. The parking lot was a bit crowded at times, but we always had a space. The elevator came in handy carrying groceries and luggage up to the apartment. There is a rinse tank and storage closet for dive gear. The only slight improvements that might be made would be a stopper for the rinse tank and a vent to let fresh air into the storage closet. The well maintained pool is very relaxing after a day of diving with lounges and picnic tables, sunny and shady spaces. Bon Bida 12 is just as it is described in the listing, modern and clean, very well maintained. The kitchen, living and dining area has everything we needed for a comfortable stay. There are 2 ceiling fans and screens at the patio door. The kitchen is very well equiped - all the cooking utensils you might need. Everything worked well - refrigerator, microwave/convection oven, dishwasher and 4 burner cooktop. The refrigerator is small by American standards, but plenty large enough, even for a 5 week stay. Being on an island we did have ants to deal with, but that is to be expected. If food is kept in tightly sealed containers the little pests don't even bother coming around. There is a clothes washer, drying racks and clothes pins, etc. The indoor dining area had a large table with 6 chairs. We rarely used it as we dined on the balcony almost every meal that we were there! There is a ceiling fan outside which came in handy for the rare fly or mosquito that came buzzing around. Both bedrooms have very comfortable, king size beds which can convert to twin beds. The master bedroom has 2 closets, screened window, air conditioner and a large en suite bathroom with double vanity. There is a safe in one of the closets. The second bedroom has a screened window, air conditioner, one closet - large enough for 2 people to share - and a large, adjoining bathroom. Tessa is very responsive to any questions via email. Ricardo, the property manager, took great care during our stay! Highly recommend Bon Bida 12!! Beautiful view. Spacious with great lighting! Very clean. Service costs 15% (at homeaway mentioned as taxes) includes change of linen and towels once a week, cleaning once a week, welcome pack in the fridge, free beach chairs at Spice Beach Club and management service. If you stay for a longer period the servicecosts will lower. Includes 15$ a day for water and electricity use. Extra use will be charged at the end of your holiday. Tourist tax: $5,75 per person per night for persons of 13 years and older. An additional payment request will be asked for this. PayPal payment accepted.